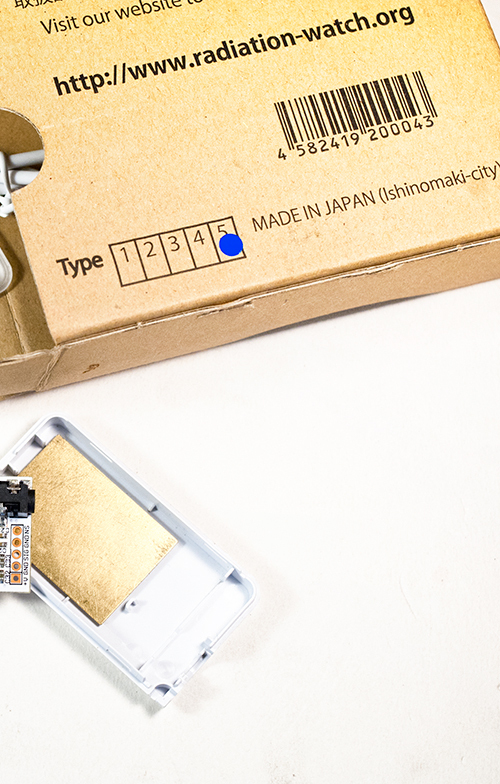 The Radiation-Watch gamma ray sensor kit is made in Japan for people who live near the Fukushima reactor melt down site, to monitor their local radiation. The sensor attaches to a phone, or can be used with a microcontroller, such as Arduino. This gamma ray detector uses the innovative X-100 photodiode from First Sensor. It's a scintillation device - any gamma ray impinging on the 1 square centimeter active surface of the chip will output a pulse. The Radiation Watch device sends a pulse on the signal output line when a gamma ray is detected. The board includes a noise output, which goes high whenever the device experiences physical shock. I don't use this feature in my device. To use the sensor, I built a minimalist counter. My counter is compact, accurate and reliable. Plus it's cool looking. I used the 14 pin AT Tiny 84 as the microcontroller - its the smallest avr chip that has the resources needed for this device. It has a high speed 8 bit parallel port to connect to the seven segment LED display, an input pin that uses the microcontroller's external interrupt to read the pulses, a digital output pin capable of supplying 30 milliamps for short periods, and a second input pin to which a switch is attached. The sensor connects to the counter with a 1/8 inch connector, which is included in the kit. There are several controls. A power switch turns it on and off. A reset button starts a measurement over. A mode switch can be set to counts per minute, or counts per second. And a silence switch turns off the clicking sound. The outputs are a bright green LED that is flashed on gamma ray detection, an active buzzer that clicks, and a seven segment red LED numeric display with a decimal point. Power is provided by 3 aaa cells, which snap into cell holders. The entire device is on a single circuit board, and has no case. Radioactive decay happens randomly because it comes from a non-deterministic quantum process. When counts are calculated as a frequency, decay data has one significant figure of precision at best. So a single digit numeric display is really all that's needed. A flashing decimal point shows the order of magnitude, giving a range of 0 to 1000. This can handle most radiological situations you'd be likely to encounter. greater than 1000 just shows a blinking decimal point. 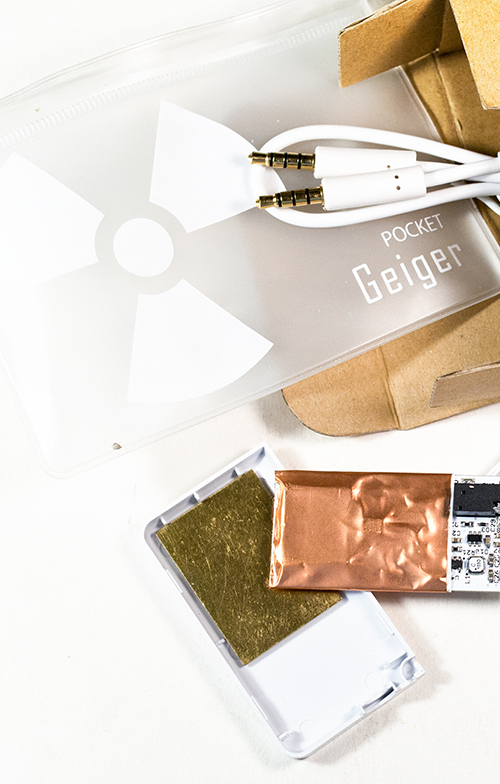 Just like a geiger counter, this device has a bright green flash, and a click for every count. You can judge a radioactive source's activity by it's sound and sight. You don't need to interpret the numeric display to sense the radiation level. If it sounds hot, it's hot! The display has two modes: counts per minute for background radiation, and counts per second for radioactive items. If counts per minute is too high to read, switch to counts per second mode. If it still reads over a thousand counts per second, move away from the source (probably a good idea anyway), and multiply the reading by the square of the increase in distance. To determine dose, divide the counts per minute by 53 to get uSv/hr, the sensor has been calibrated for cesium 137. If the counter is in background radiation mode, the average counts are calculated as counts per minute, and the average is displayed every second. It takes a few seconds for the counts per minute value to stabilize. Display of counts per second is in real time-l IF the clicking is bothersome, it can be turned off, but the green LED will always flash once per gamma ray. The Arduino code reads the pulses and outputs to the 7 segment numeral very fast. It can handle even the highest measurable pulse count without skipping pulses. If two or more pulses are encountered simultaneously, the device beeps instead of clicking. To accomplish this, the 7 segment display chip is wired directly to the 8 bits of port A on the Tiny84 (each LED with an appropriate resistor), so an entire number can be written with a single 'PORTA = n' instruction. The sensor sends 50 μs pulses directly to the hardware interrupt pin of the microcontroller. The interrupt code just sets a flag, true or false, indicating whether the signal is high or low. The loop code determines if the pulse has begun or ended, turns on or off both the LED and the buzzer - the short duration of the pulse is what gives it a sharp click. The number of finished pulses are added up, and the seven segment display is updated every second. MCUCR &= ~(1<<ISC01);  // clear bit ISC01 "    "     "   "   "    "       "
sei();                 // ... did I mention I HATE Atmel's acronyms? 101-365 is a blog of truth and beauty, art and science, new and old, what have you. After nearly ten years, this blog returns.